What a difference a week can make. U.S. stocks pulled themselves out of their holiday funk, and put the major indexes back on solid ground, closing the week at new all time highs or very close to that level. The one remaining weakness is trading volume. The Dow Jones remains the leading market average, followed closely by the S&P500. Both are at new all-time high prices. The Nasdaq, which had been leading the decline, isn’t far behind. Given last week’s strong showing, the market is back in an uptrend from a moving average perspective. The price/volume viewpoint of the markets remains the same; price action supports an uptrend and trading volume doesn’t. Friday’s rally had the same issue as the week prior: reduced trading volume. If we have another strong weak, some of older distribution days will fall outside the 4 week window, and this indicator will move back into uptrend territory. OEW reversed course, putting the markets back in an uptrend. Either the former rally is extended (something it’s done many times), or we just experienced one of the smallest corrections in recent memory (2-4% depending on the market average you’re looking at, 0% for the Dow). After several weeks of almost ZERO proper bases in high quality growth stocks, several names popped into my watch list for this week, which is a welcome sign. 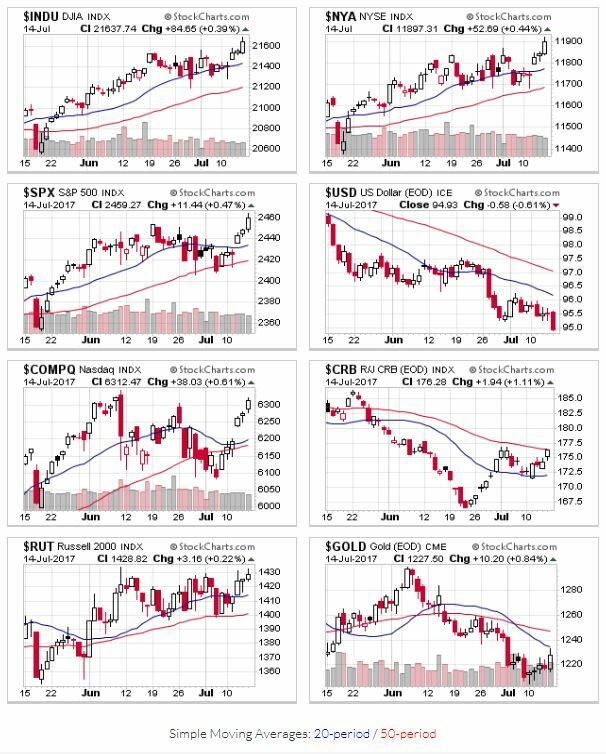 Weak price/volume action towards the end of June tripped a lot of sell triggers for my existing holdings, and the lack of fundamentally strong companies with proper technical bases had me concerned about the severity of the next correction. We’re still overdue, but the probability is lower near term.